Sarah Chauncey Woolsey wrote under the pen-name Susan Coolidge. Sarah Chaucey Woolsey was born into a wealth and influential New England family living in Cleveland. One of her uncles was Theodore Dwight Woolsey, president of Yale College. The author and poet Gamel Woolsey was her niece. Sarah spent much of her childhood in New Haven after the family moved there. She travelled to Europe in 1870–1872 and then settled with her family in Newport, Rhode Island. She never married. She served as a nurse during the U.S. Civil War and then began to publish her writing, using the pseudonym "Susan Coolidge." She's best remembered for the classic five-volume What Katy Did series, but Susan Coolidge also was a prolific writer of verses and short stories for children. 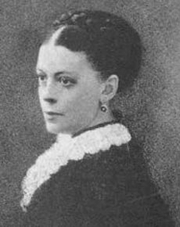 In addition, she edited several works including The Autobiography and Correspondence of Mrs. Delaney (1879) and The Diary and Letters of Frances Burney (1880). Susan Coolidge is currently considered a "single author." If one or more works are by a distinct, homonymous authors, go ahead and split the author. Susan Coolidge is composed of 11 names. You can examine and separate out names.